World Maker Faire took place on Oct. 1-2 at the New York Hall of Science. We were lucky enough to have to opportunity to organize some amazing presentations at the Education Stage. We hope that you were able to make it! We’ve asked a few of our panelists and guests to recap the festivities for those who weren’t able to be there. Janet Hollingsworth is an engineer turned furniture-maker-librarian who co-founded BLDG 61, the Boulder Library Makerspace in Boulder, Colorado. As a creative technologist, she curates and facilitates maker programming at BLDG 61 including: fiber arts, screen printing, woodworking, laser cutting, machining, robotics, digital fabrication, bookbinding, and more. 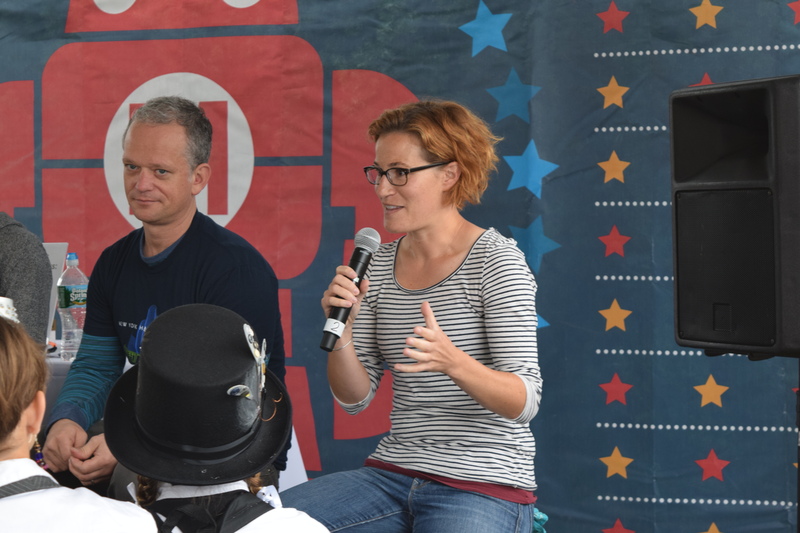 Since World Maker Faire, I have found myself thinking a lot about maker culture, and how we as maker educators help create environments for youth and adults to be inquisitive and find their voice. At the Meet Maker Educators panel, I was fortunate enough to share the stage with Ryan Reedell, Doug Baldwin, Liz Whitewall, Jackie Moore, Akili Lee, and David Wells. While we shared a similar mindset for creating user-driven maker programs, we all have different strategies for hitting the sweet spot of creative direction and community engagement. Many of my co-panelists described successful programs as finding a balance between hands-off facilitation and offering intriguing prompts. As David Wells pointed out, it’s also important to encourage students to stick with challenging problems and have patience as facilitators. 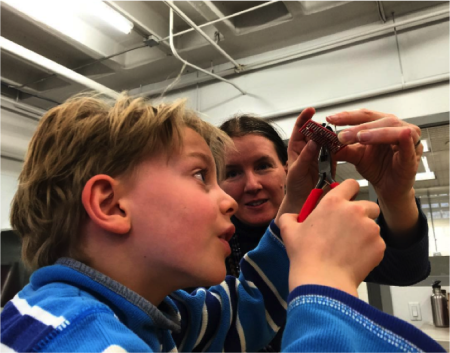 The idea of cultivating an inquisitive (and supportive) environment has left me reflecting on the approach we have taken at BLDG 61, the Boulder Library Makerspace, and the challenges we face as an all-ages no-fee informal learning space. One aspect to our approach is celebrating storytelling as a part of maker education and seeking out the underserved, introverted, and overlooked voices in our community. The panel agreed that we should challenge ourselves by asking how those voices can be heard and empowered. The challenge we’ve faced at BLDG 61 is identifying what shape this will take. It’s kind of a moving target with such a diverse audience. I think that the most important thing we have done so far is creating a place where everyone feels welcome. There is a culture at BLDG 61 that has grown out of transparent learning. I have come to love when a patron (child or adult) asks me a question I don’t know the answer to. I love learning new things, and find myself saying more and more often, “I have no idea, let’s find out!” Co-learning is an important aspect of collaboration and innovation, and it implicitly exhibits value for lifelong learning. This ethos sets the atmosphere for learning and sharing experiences (good and bad, highs and lows). Here are a few examples of how we are seeking out different voices at BLDG 61 with our underlying purpose of lifelong learning for everyone. During our U-Fix-It Clinics, we invite the community to bring in broken devices—from paper shredders to chandeliers—and work alongside volunteer engineers and mechanics to repair the items. An eighth grader, Rebecca, brought in her electric scooter. She was quiet and dedicated to getting her scooter operational again. She stuck around for the entire three-hour workshop, well after her scooter was running, mostly observing the troubleshooting going on in the space. After this workshop, I found a letter drafted on BLDG 61’s 1953 Smith-Corona typewriter by Rebecca indicating how important these workshops were to her. 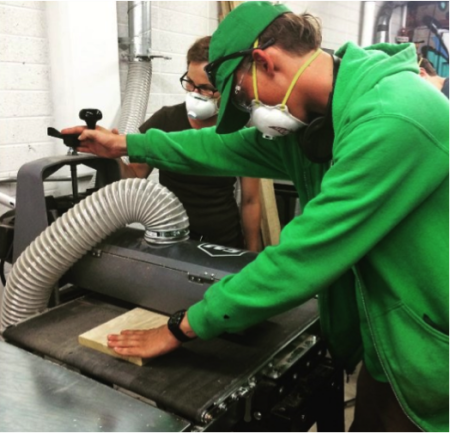 In September, we launched the first of several 3-month long woodworking apprenticeship sessions, TreeOpp, funded by the Knight Cities Foundation and in partnership with Parks and Recreation and Bridge House. Bridge House is a non-profit dedicated to equipping homeless individuals with employable skillsets and guidance to find stable housing within a 12-month period. Shannon, one of BLDG 61’s apprentices, came to us through this partnership with Bridge House. When sharing her story of leaving an abusive relationship with no home and a drug addiction, she refers to Bridge House and BLDG 61 as being a part of a transformative moment in her life. She now hopes to direct her new skillset to creating connections between individuals experiencing homelessness, and other members of the community. This will be achieved by developing and making simple and useful items at BLDG 61 to connect people purposefully in our community. I think we have a unique opportunity to discover who we are through making. Part of this process as maker educators is to provide outlets for students to share experiences and find their voice. 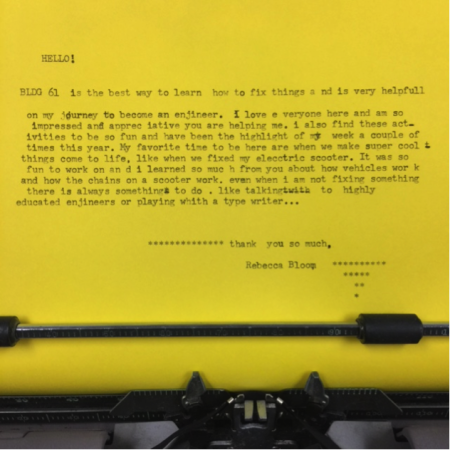 Sometimes, it’s as simple as leaving a typewriter out with fresh ribbon and paper or allowing adults an opportunity to course correct and find a new direction through making.